More than 120 superintendents, principals and teachers throughout Alabama attended the May 2 conference, “Neuroscience of Learning: A Follow Up to the Finland Summit,” presented by Orlean Beeson School of Education in partnership with the Goodrich Foundation. Attendees represented more than 20 school districts as well as several private schools, Alabama State Department of Education and Alabama Department of Public Health. According to David Finn, Samford professor and member of the event’s planning committee, the goal of the conference was to continue the conversation about factors that positively impact student achievement. “The philosophy and practice of educational neuroscience embraces those factors, and has caused contemporary educators to consider ways of incorporating those principles into the daily lives of all children,” said Finn. In the interactive morning session, Lori Desautels, assistant professor at Butler University, shared her passion for engaging students through neuroscience in education. She integrates mind brain teaching and learning strategies into her courses. Desautels said it is crucial for educators to provide students with all the tools they need to learn in the classroom. Those tools can be better identified when there is an understanding of what the brain needs to learn. Attendees participated in breakout sessions were based on one of seven key points identified in the fall 2016 Finland Summit conference. In one session, participants discussed the need for movement in the classroom. “Keep your students engaged and ready to learn through what I call brain breaks,” said session facilitator Chelsea Byrd, a teacher in Jasper City Schools. She showed a video that used a dance and rap to explain the water cycle from a website that holds hundreds of videos created to activate students’ bodies and brains. April Brand from Helena High School led School Based Time—Pack 60. “Pack 60 was instituted to provide students with a break from academics through a variety of scheduled options during their lunch period,” said Brand. Students are given 30 minutes to eat and 30 minutes to meet with extracurricular clubs and to build student relationships. Superintendent of Fairfield City Schools Walter Gonsoulin believes in the importance of students having basic needs met in order to learn. “We want to remove barriers to student success by helping students and families access comprehensive wrap-around services,” said Gonsoulin. “These services include, but are not limited to, primary health, dental care, vision care and mental health care.” The services are offered at or near the school site. 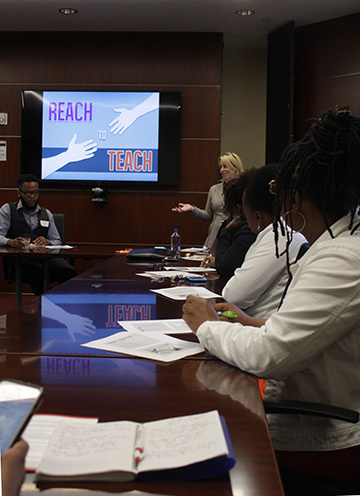 In addition to her conference presentations, Desautels met with Orlean Beeson School of Education undergraduate and graduate students in the afternoon. “I am so excited to share a couple of things that I wish so desperately someone had shared with me when I was a new teacher,” said Desautels. Desautels explained that this is what happens to students when they walk into a classroom with baggage or a weight over their heads. Students often shut down and are unable to learn.